Ever noticed that most playing cards have a cute geometric pattern on the back? Play with them in a different way! 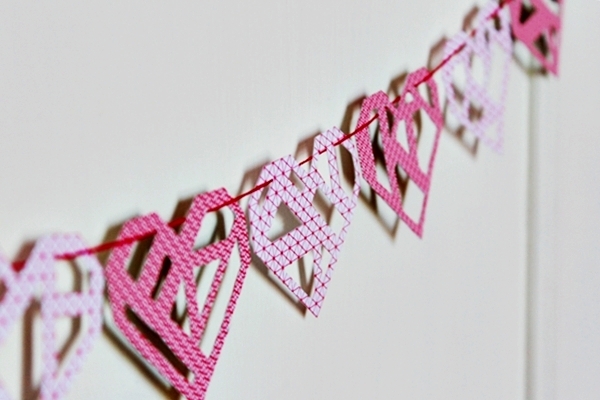 In this tutorial, you'll learn how to transform an old set of cards into a gorgeous garland that will fill the house with love and geometric goodness for Valentine's Day. 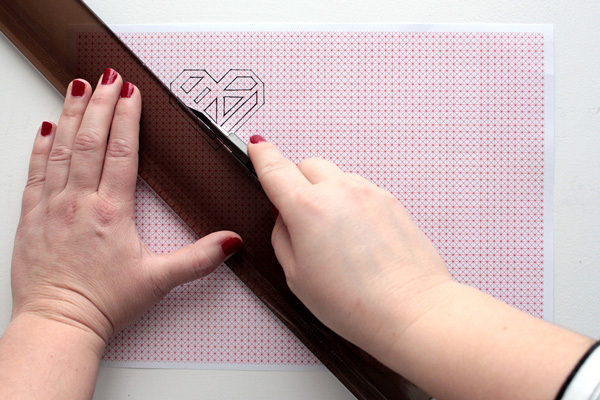 Download the template with the grid and print it out on to A4 paper. Try to use thick paper if possible (160g to 200g works best). 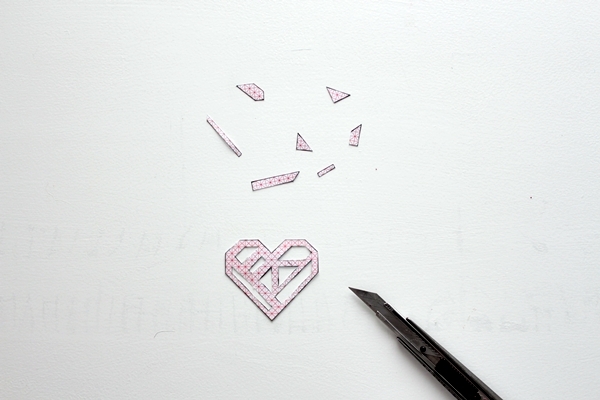 Place the printed grid on your working surface and draw the outline of the heart. 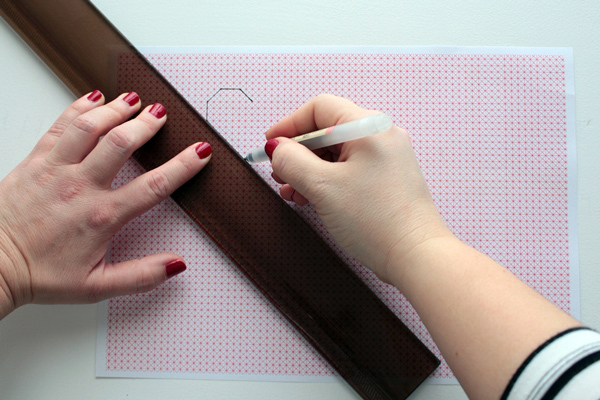 Use a ruler to assure your lines are straight, and a pencil so that you can erase the marks later on. 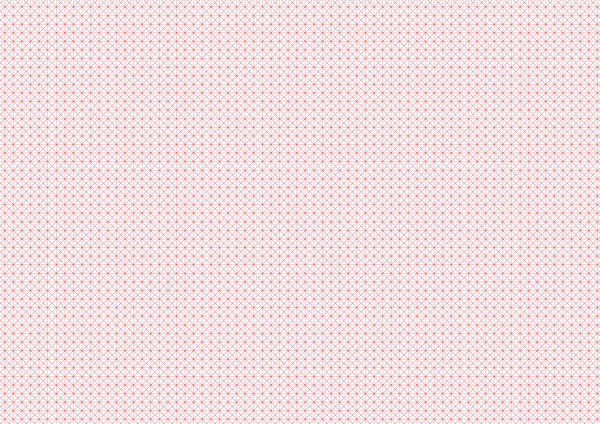 I am using a pen in this tutorial so that the lines are more visible. 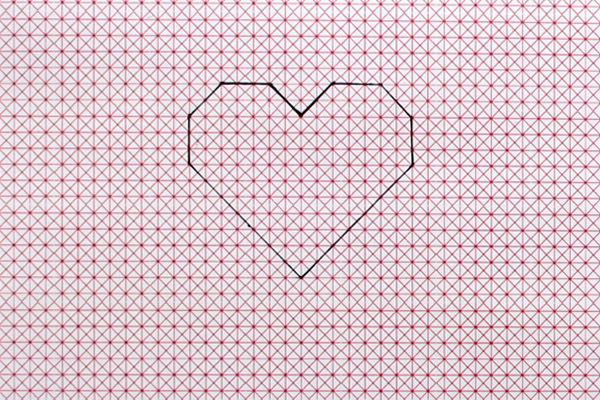 Now I'll guide you through the heart shape in reference to the printed grid. Let's draw the left side first. Start by drawing a diagonal line going upwards to the left, two grid boxes wide (1). Continue with a horizontal line three boxes wide (2). Now, draw a diagonal line going downwards and to the left two boxes wide (3). Go straight downwards for three boxes (4). Now draw a diagonal line going downwards to the right, seven boxes wide (5). The finishing point of this line should meet the vertical axis of the starting point of the heart. 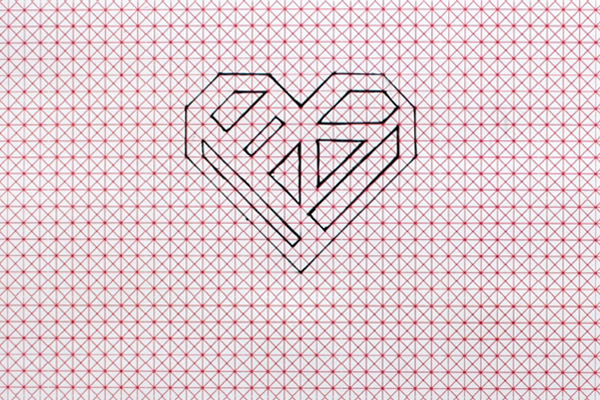 Now, all you need to do is mirror this design on the right side, and the outline of the heart is ready. Now draw some inner geometric shapes, using the grid lines as a guide. 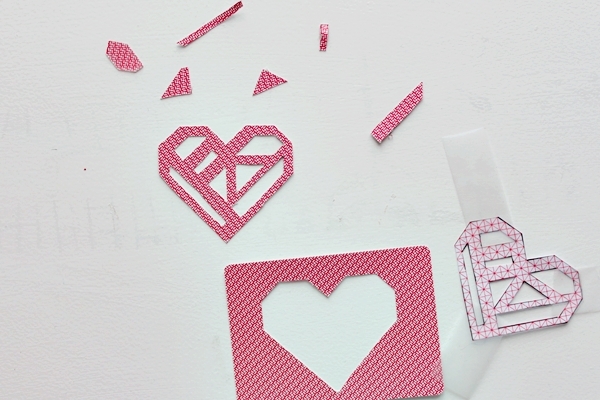 Keep in mind that these shapes will be cut out of the heart. 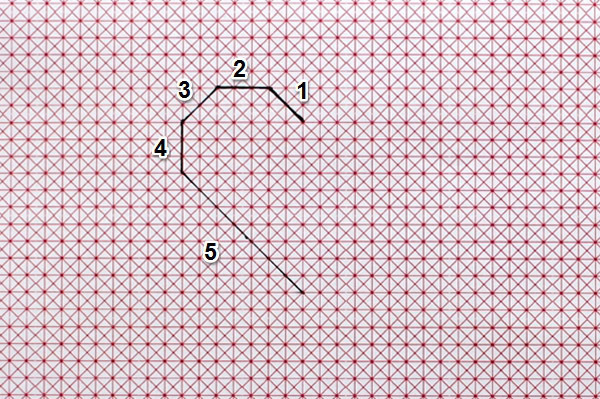 Therefore, you need to keep a zone of solid heart in the border and start designing these shapes inside of it. You can design your own shapes or download the template of my designs and print them out. You might like to fill in the shapes that need to be removed with a black marker, so that you can see where you need to cut. Using your craft knife, carefully cut out the inner shapes. 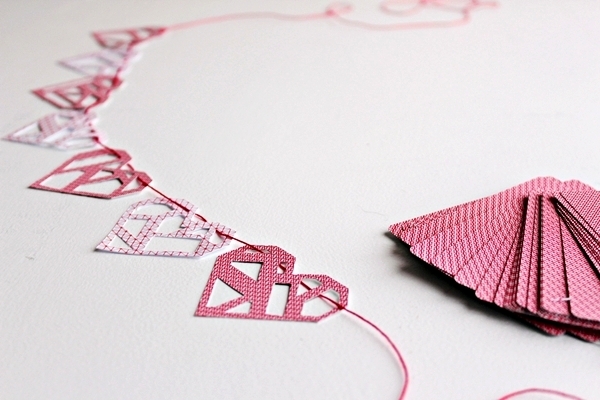 This is a delicate paper-cutting task which you can do freehand or with a ruler. There are two ways to make the cuts. 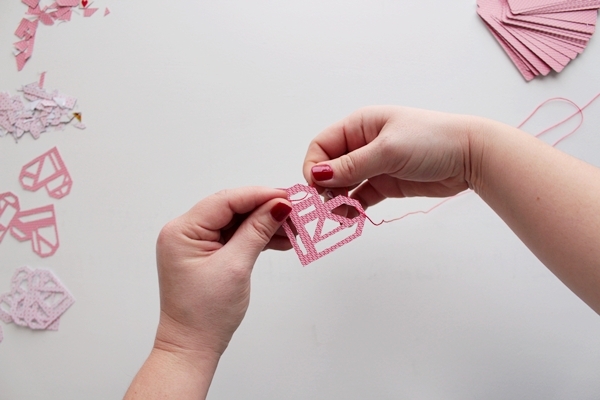 You can cut each shape individually and remove the cut-out piece. Or, you can cut all the lines of the design that are in the same direction before moving on to the next set of lines, and work around the design until you've removed it. In any case, you may find it easier to turn the paper around with your free hand, and always place it in a convenient position for your cutting hand. 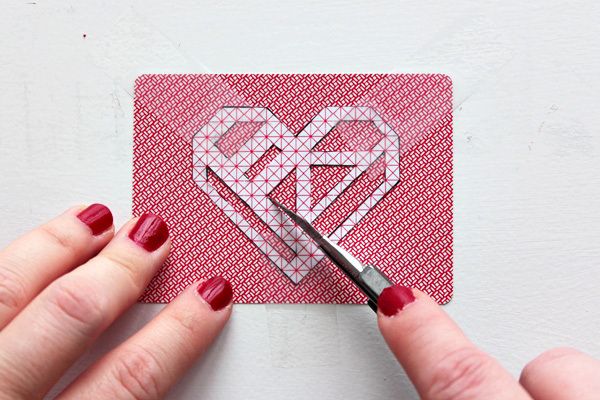 Once all the inner geometric shapes are removed, it's time to cut around the outline of the heart. Repeat this process with various design of your own, or with the six templates. 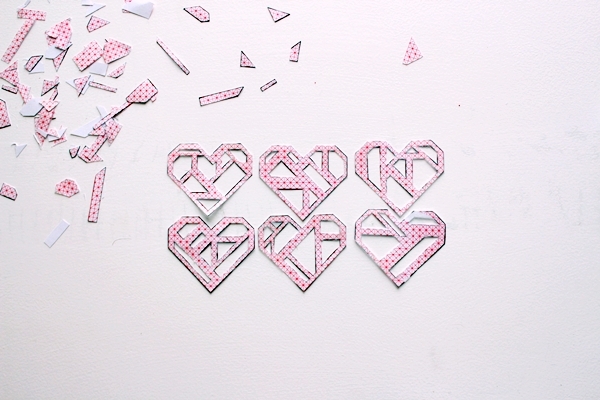 When the hearts are ready you can erase any pencil marks. Nicely done! 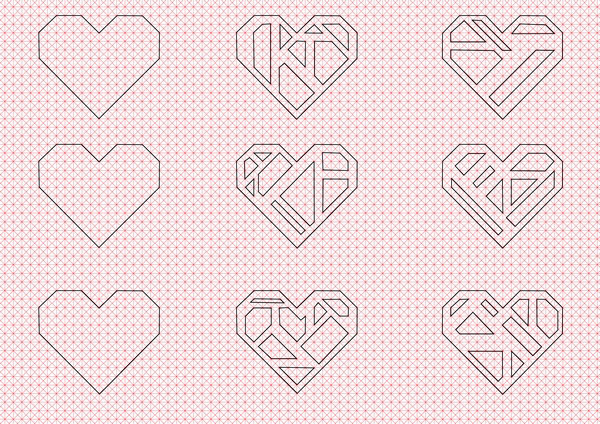 Use the six designs in the template as prototypes to create as many hearts as you need. 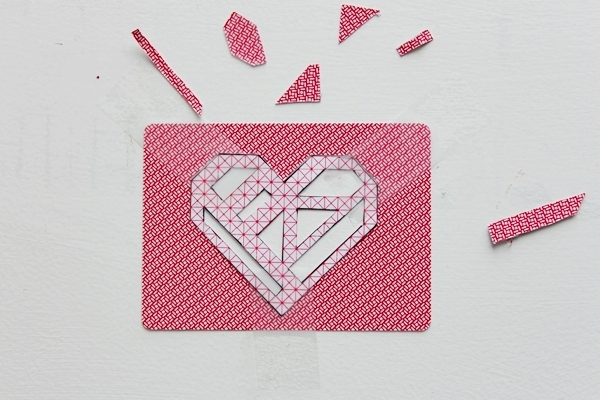 Place the playing card with the pattern side facing upwards and place the heart template on top. 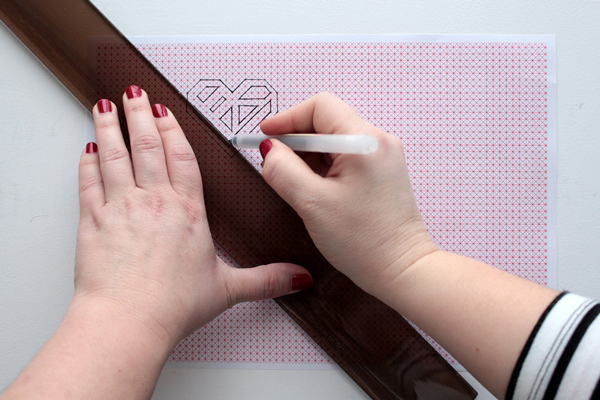 When you're happy with the position, use sticky tape to secure the template in place. Now, repeat the same cutting technique as described in Step 2. Only this time, the card is slightly thicker and you won't be able rotate it, so it's a bit more difficult. First, cut out the inner shapes. 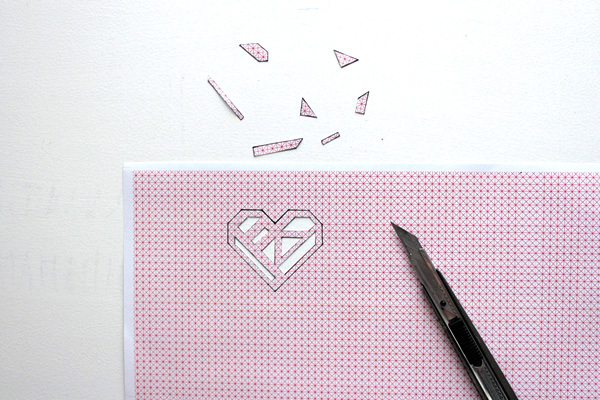 Now, cut out the outline of the heart. 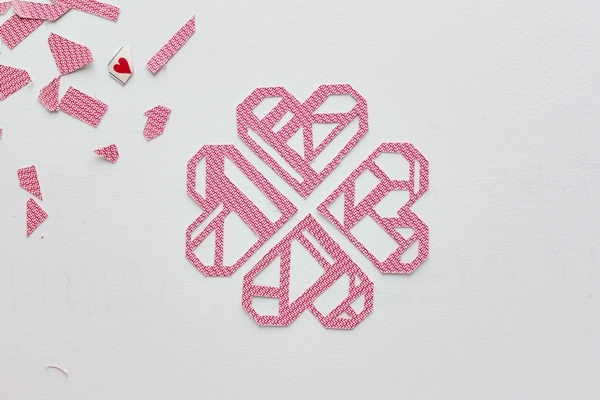 Repeat for all the designs and make at least six more hearts. Cut a long piece of the red pearl cotton thread. 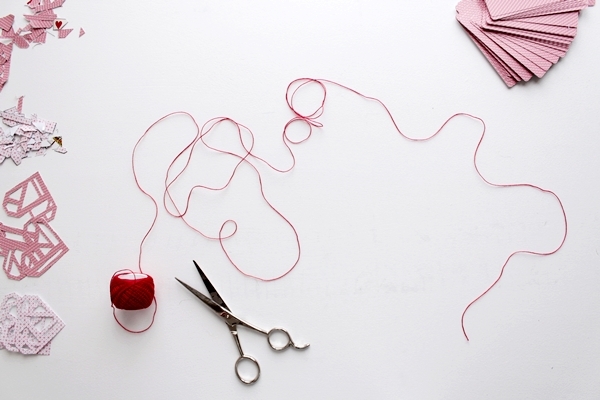 Pass one end of the thread through the right upper hole of the heart and pull the thread downwards. Bring the thread back upwards at the upper left hole of the heart and pull through. 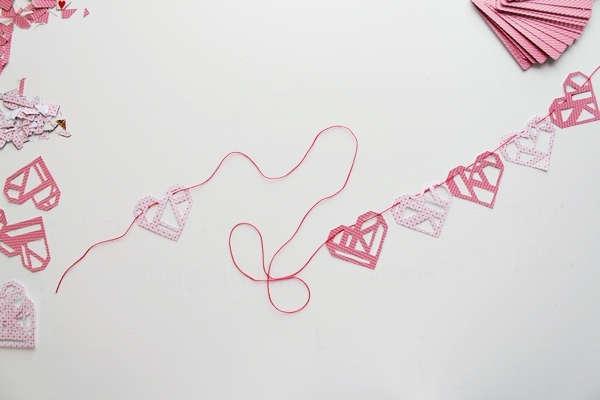 Repeat the same process threading all the hearts in the garland. Alternate the cards with the grid design. Now just hang it on the wall using some sticky tape or washi tape. When it is up, you can rearrange the hearts if needed. Looking good! Great job! 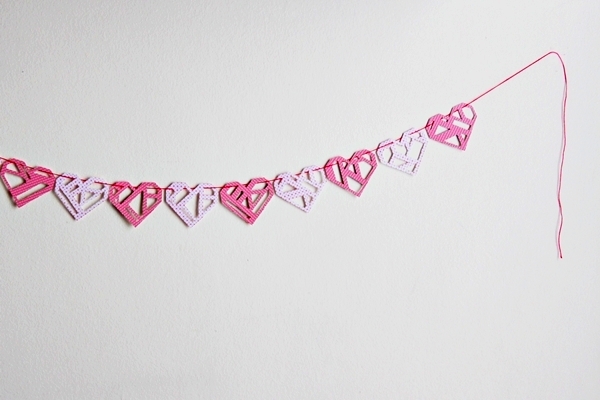 Your lovely garland is ready for Valentine's Day - and beyond. 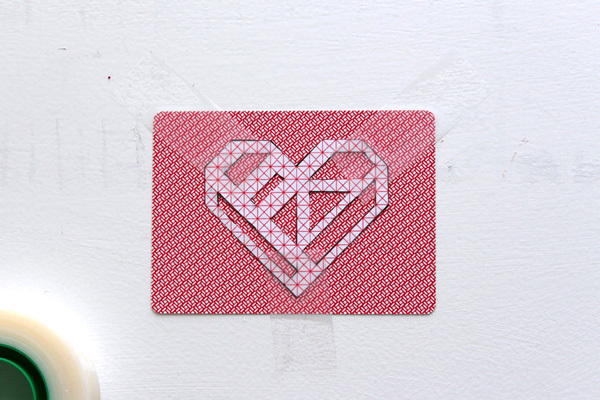 In this tutorial, you learned how to design a geometric heart from a playing card, cut it out, and create the perfect garland. 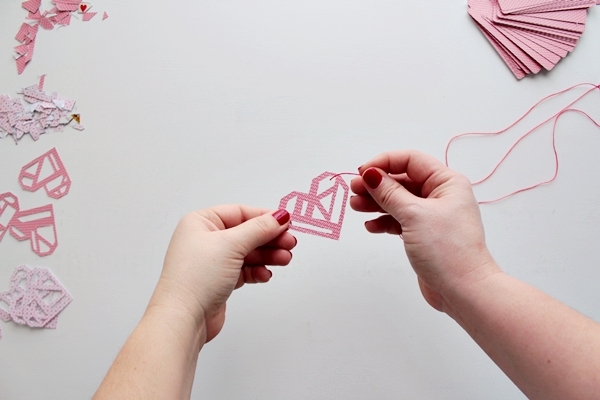 You can use the same technique and design to make many more love-inspired paper-craft projects, like a gift tag or a Valentine's Day card. 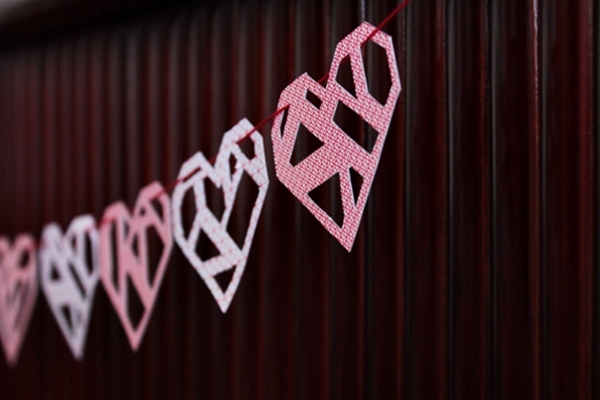 Look out for another Valentine's Day project using geometric hearts in an upcoming tutorial! 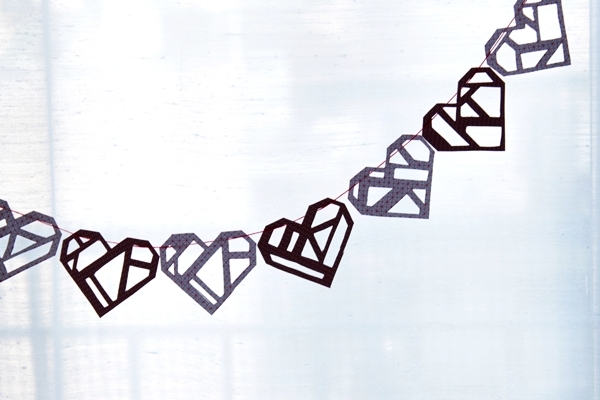 Can you think of any other ways you could use the geometric hearts? Let us know what you think in the comments section below.